Local stocks slinked off to the Christmas weekend with nary a sliver of optimism in sight, amid worries of slowing global growth, the United States rate hike and an impending US government shutdown. 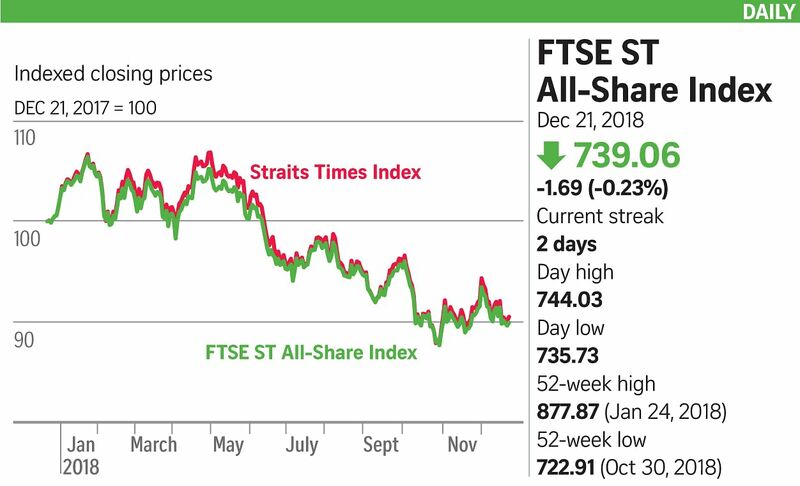 The Straits Times Index fell 4.58 points, or 0.15 per cent, to 3,046.04 yesterday, about 1 per cent lower for the week. Losers outnumbered gainers 235 to 147 on turnover of about 1.31 billion shares worth $1.27 billion. Hopes of a possible Santa rally were thoroughly crushed mid-week, due to the US Federal Reserve's less dovish-than-expected policy statement. To add salt to the wound, investors had to contend with the threat of a US government shutdown. Weary US equities extended losses for six consecutive trading days overnight. Regional stocks also ended the week broadly lower - a sign of investors continuing to shift funds out of risky assets such as equities and being more content to wait and see, according to market watchers. Mr Olivier d'Assier, head of research for Asia-Pacific at Axioma, said: "Volatility is more than twice what it was earlier in the year, so has your return forecast for next year doubled in the last few weeks? If not, then there is no excuse for holding on to negative risk-adjusted returns, is there?" Tech stocks pointed lower here, with the sector's largest stock, Venture Corp, down 1.13 per cent to $13.98. Hi-P, which makes plastic and metal parts for Apple, pared down 0.54 per cent to 92.5 cents, while consumer electronics manufacturer Creative Technology sank 4.84 per cent to $4.92. Oil prices continued their downward spiral over oversupply fears, exerting pressure on local energy and offshore marine stocks. Sembcorp Marine fell 1.92 per cent to $1.53, while Sembcorp Industries dipped 1.18 per cent to $2.51. Offshore marine player Nam Cheong shed over 14 per cent to 0.6 cent. But banks, with their exposure to the energy and offshore marine sectors, largely held their nerve. DBS was up 0.21 per cent to $23.45 and United Overseas Bank put on 0.16 per cent to $24.35, but OCBC Bank retreated 0.09 per cent to $11.07. CMC analyst Margaret Yang believes "relatively reasonable valuations and high-dividend yields" will likely cushion the downside for banks. Rising interest rates will also support the banks' net interest margins and offset the slowdown in other non-interest income items, she said.